Not one of mine (you can thanks Google Images for this) as the blocks in use are Kriegsspiel types. Mine are far more basic although I have the same buildings! It never ceases to amaze me how spending a short while organising a part of a collection can suddenly turn into a full blown project. I recently decided to revisit the block armies - more as a way to pass some time than with any coherent plan in mind - and lo and behold, I am now moving them into pole position in order to realise a few ideas I have floating around. In truth recent events have made me think about a number of things and so extracting the maximum mileage out of one part of the collection has assumed greater relevance than before. In respect of my block based wargames I have fought games on both maps and a tabletop. I have used both 2D and 3D terrain and even a mix of the two. All have much to commend them and if I am honest using any variation is fine by me, for my own use it really does not matter. 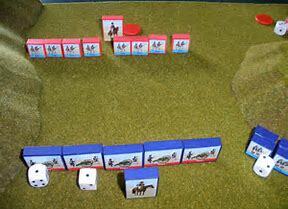 I have also seen games using Command and Colours Napoleonic troop blocks on a tabletop – I have tried the same using Hexon but did not really enjoy the experience as the hexes were too large and the units looked a little lost – which is something perhaps I should also explore. I guess the point I am trying to make is that it does not really matter whether you are using blocks on a 2D or a 3D basis as long as you make sure in the latter case that the terrain ‘fits’ from a visual perspective with the size of the blocks you are using. As my blocks have a frontage of 30mm and are around 11mm high then terrain from 10mm and smaller is ideal (not 15mm as I originally thought – most of this is too large). Using a 2D map is fine although I would tend to use this for more 'open' games - scrunched up contour lines or an intensive road network with lots of urban development strains the use of blocks in my opinion, we are closer to boardgames at this point. The biggest challenge - aside from the use of the appropriately aesthetic terrain - with using blocks remains the need for a clear narrative of what the action is actually representing – the same of course is equally true when reading an account of a battle supported by a map. Again this is something I have touched on before as previously my battle reports ranged from highly detailed to bare bones like. The latter meant that the in game pictures were a little tricky to follow. From my perspective they all made perfect sense but I freely concede that the supporting narrative should have been a lot clearer. These are my basic block types although I have added 'heavy' and 'light' to the cavalry, artillery and infantry blocks. 'Heavy types have a thick black bar along the bottom edge whilst 'Light' have a white bar. I am still not sold on the middle and bottom row though. I want to take the blocks to the next level in terms of how they are seen when used in a game setting. I am thinking that perhaps using some digital wizardry on any in game pictures may help – movement direction arrows, damage inflicted, that kind of thing. Coupled with text that is closer to the point of action will also help. So there is still much to think about with this collection and if I am honest it is currently dominating my thoughts. I will have a rather novel solution to the 20th century angle though - this will form a post later in the week. Interesting read as always. I look forward to your 20th Century variation or is it still an enigma or indeed a solution? Many thanks for kind comments - it is much appreciated. As for the 20th Century variation - it could be a solution to the enigma!